Bully and the Shrimp tells the tale of little Noah who moves house, and moves school and despite making a couple of really good friends, also finds himself the subject of unwanted attention from a Bully. This picture book is designed to delicately tackle the subject of bullying for children by adding a narrative around it and the book has been developed with input from school teachers and child development experts. Lara listened intently when I read her the Story of Bully and the Shrimp - I'm not sure if it struck a chord with her, or whether she recognised the theme but she sat there in silence from start to finish (this is unheard of). The pictures show a recognisable school classroom and playground scene which I think helps children to identify with the theme. I wouldn't say it was the most uplifting of picture books we own, but it does have an important message (be strong, say no, confide in your friends) and certainly a happy ending when the Bully then turns into a friend too. I'd recommend Bully and the Shrimp to any primary school aged child, not just those affected by bullying. 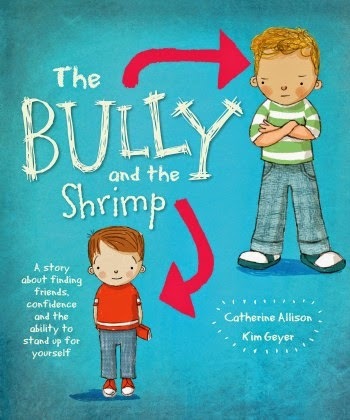 Bully and the Shrimp is written by Catherine Allison and illustrated by Kim Geyer and is published by Parragon books. You can follow Parragon Books on twitter and as @parragonbooks on instagram and pinterest.